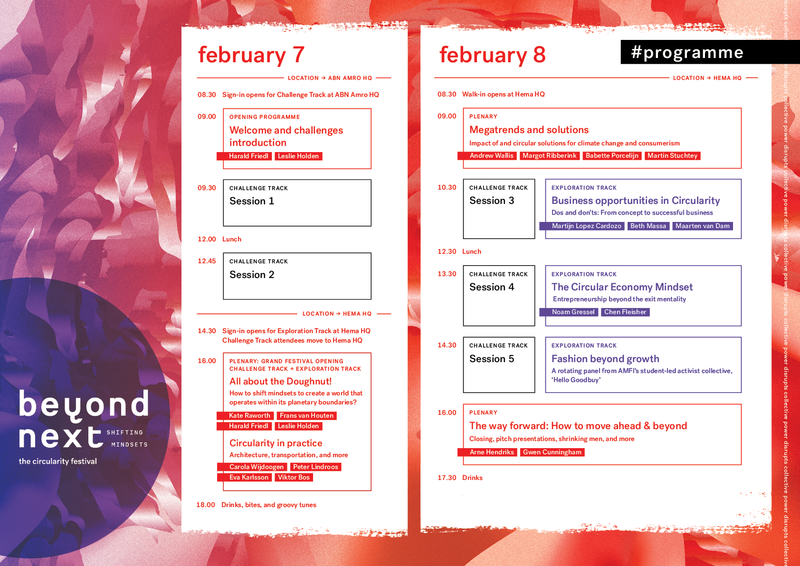 Beyond Next took place on February 7-8, 2019 in Amsterdam. To view photos from the event, please click here. To learn more about the event, keep scrolling! Beyond Next is all about inspiration and action. It offers you a chance to put your skills & knowledge to work alongside other circularity experts. You can work on real life circularity challenges that four organisations are facing. Alternatively, find inspiration through our different exhibits and keynote talks where you can learn, exchange and contribute to shifting mindsets. Join us in Amsterdam from 7-8 February 2019 and show how collective power disrupts! Focused on exploring the economic mindset needed to address the 21st century’s social and ecological challenges, Kate is the keynote speaker and the creator of the Doughnut of social and planetary boundaries. Author of 'De Verborgen Impact' (The Hidden Impact), she studied Industrial Design at TU Delft and is now also a sustainability advisor to organisations. Co-Founder & CEO, ECO-OS Inc.
Ride the circularity wave through two days of inspirational speeches, panel discussions and interactive sessions where you can learn, exchange, contribute and be part of the collective power that makes up this movement! Both tracks will convene for several key speeches and sessions in the plenary. 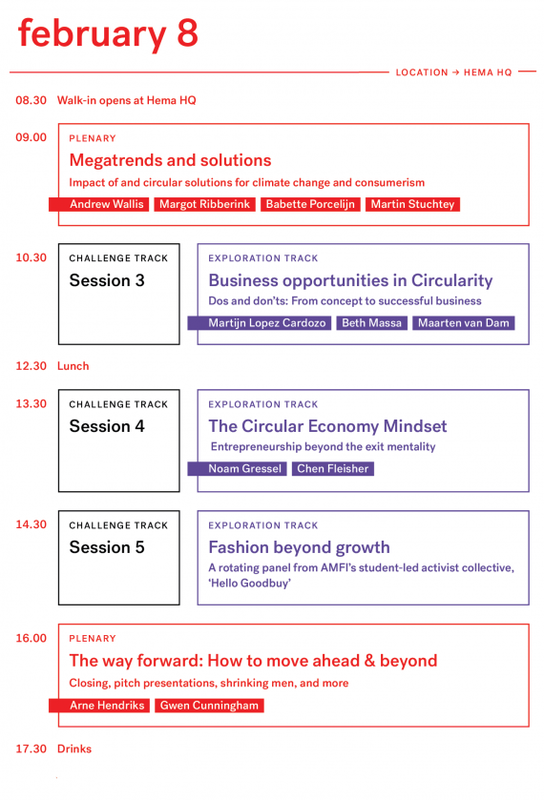 Event partners AMFI, ABN AMRO, City of Amsterdam and HEMA will lead two-day challenge workshops covering four major themes of education, product as a service, organic waste in a circular city, and single-use plastic respectively. For more details, keep scrolling. We are only 9% circular. Our linear economy is failing the environment and economy. What do we need to do to achieve a circular economy? What solutions can we provide to businesses and society? 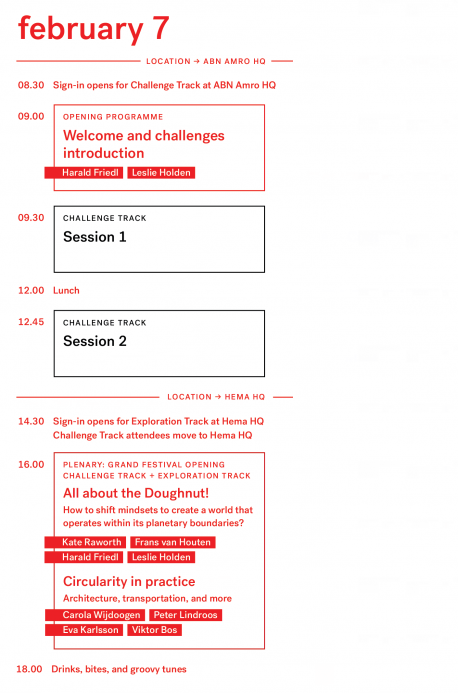 Event partners AMFI, ABN AMRO, City of Amsterdam and HEMA will lead two-day challenge workshops with the aim to collaboratively develop answers and solutions to these questions. AMFI: How can fashion education equip students for a new reality? ABN AMRO: How can we promote access over ownership in the home? City of Amsterdam: How can we effectively recover and reuse organic waste in the city? HEMA: How can we transition to a system free of single use plastics? "The key learning for the day was that we all have a huge opportunity ahead of us to look at waste from a different perspective. There are many opportunities to develop new business models by considering waste as a resource. I see the Circular Economy approach as the evolution of the sustainability movement and I am convinced that it will change how businesses operate." A social enterprise, organised as a cooperative, we accelerate the transition to circularity through on the ground, action focused, development of practical and scalable solutions and international campaigns, communications, and engagement. AMFI is currently the largest fashion institute in the Netherlands. More than 100 lecturers teach more than 1100 students about all aspects of the fashion world. AMFI’s education covers all facets of fashion from developing a raw idea to a product and an image. Save your spot and get ready for two inspiring days of action! Sign up for updates and stay involved with Beyond Next as we reveal workshop challenges, speakers, prizes and other exciting news!